This example project was implemented by SYSBIOTECH. 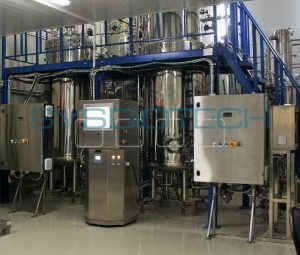 It is a pilot-scale facility for developing of fermentation processes with fed-batch strategy. 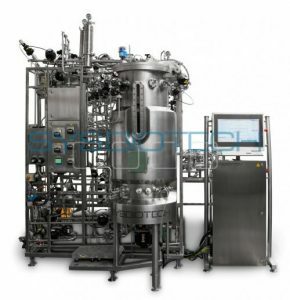 Fermenters were specially designed for working with bacterial cultures with strong oxygen demand. Fermenter and feeding tanks are installed on load-cells so that we could know the weight of the contents. All equipment is connected with each other, so that feeding process could be done in automatic mode. 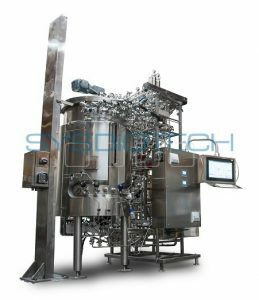 Fermenter and feeding tanks are equipped with fully automatic SIP/CIP systems. 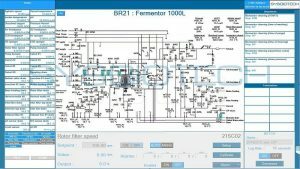 Fed-batch process can be triggered by a signal from on-line glucose measurement system or by a pre-set program. You can write a program easily in our C-BIO2 control system. 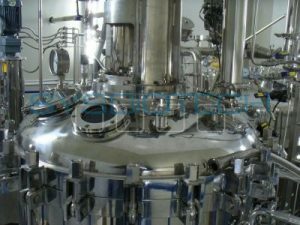 Agitation system for the fermenter was developed for strong oxygen transfer; inlet and outlet filters are suitable for aeration of 2.5 vvm. 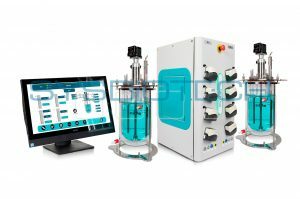 Agitation system for the feeding vessels helps to sustain constant solution concentration. All transfer lines are sterilized automatically before transfer process. 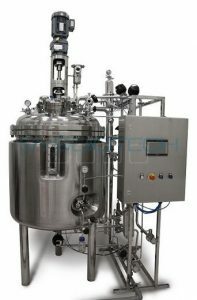 Fermenter is connected with harvest tank by aseptic line for continuous fermentation process development. 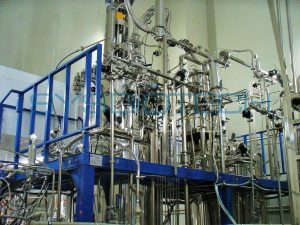 Suitable for continuous fermentation process.